After spending so much time in this space talking about the various difficulties of turning a zombie story into an ongoing television series, it’s worth pointing out that there are at least a few things zombies add to the mix that you can’t get anywhere else. While the immediate objectives are often muddy and abstract on The Walking Dead, the main goal is always the same: Don’t get eaten by zombies. Most of the show’s ensemble wants to live, and even the few who don’t aren’t in any hurry to have their guts torn out by a snarling, shambling corpse. There’s no real need to explain how zombies can continue existing, as once you’ve established that this is a world where the dead can rise, it’s pretty much self-sustaining. If this was a world of vampires or werewolves or aliens, we’d need some sort of reasoning behind how they sustain themselves, and what sort of social hierarchy they form when left in control for long periods of time. Zombies are as low-fi as monsters get. From time to time, TWD throws us little bits of information, like the revelation in tonight’s episode that walkers are drawn by the scent of blood (apologies if this came up before, but Rick cutting his thumb seemed new), but while those are much appreciated and help create texture, they aren’t absolutely required. The other thing zombies bring to the party is they can help raises the stakes in any argument very, very quickly. “18 Miles Out” continues the back-half of the season’s slow, fumbling attempts to become a more solidly episodic show. While there’s no question this is still serialized, the story here had a clear beginning, middle, and end, and we stay focused the whole time on two plot arcs: Rick and Shane deciding what to do with Randall, aka Mr. Got His Leg Stuck On A Fence Spike, while Lori, Maggie, and Andrea deal in their own individual ways with Beth’s desire to kill herself. The above characters were the only faces we saw in the episode (apart from the dead folks), and there were no detours to find out how Daryl is handling his rage issues, or to see if Dale has made a special Shane voodoo doll. While I had significant problems with one of these storylines, I can’t stress enough how important it is for this series to keep this sort of structural focus. There’s a large ensemble here, but that doesn’t mean we need to see everyone every week, nor does it mean you can just throw a bunch of disparate scenes together and call it an effective hour of television. It would be possible to do an episode in which every character had a moment, sure, but that’s difficult to do, and to pull it off, you need a group of characters who are defined clearly enough that we understand what they’re going for just be seeing them on our screens. That hasn’t happened yet, and until it does, TWD is better off sticking to semi-contained arcs, working in small groups, with only a couple of plots to tell each week. Rick and Shane’s big day out worked the best for me, because by now, it’s not too difficult to understand where both men stand, and a conflict between the two of them has been building for a long time now. Without needing to over-emphasize the fact, we quickly find out that some time has passed since last week’s episode. This is another important change for the show; I can’t remember the last time we jumped forward this far, and it helps shake off some of the grinding tedium that overly specific serialization can create. 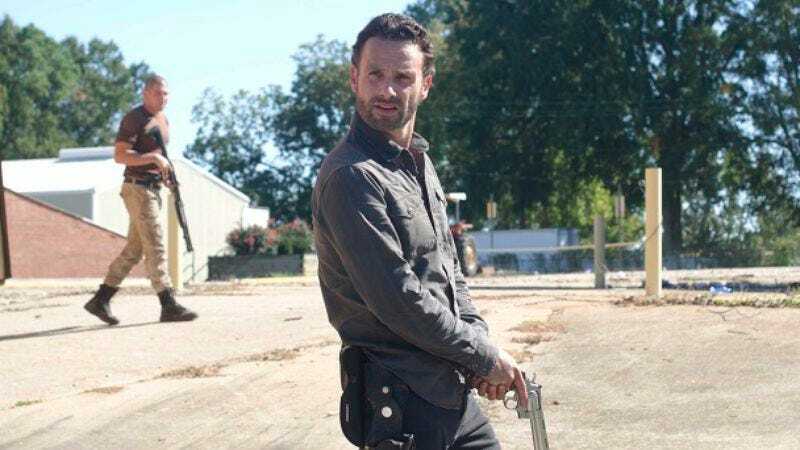 Rick and Shane are looking for a place to dump Randall, and Rick’s determined to find a spot where Randall has something like a fighting chance at survival. Shane isn’t too keen on the idea, and it’s hard to blame him, since I can’t imagine any way Rick can both salve his conscience and do what’s right for everyone back at the farm. But then, Shane has other reasons to be upset. Rick has finally laid down the law, so to speak, and told Shane flat out that either he give up on being with Lori and clean up his act, or he’ll be forced out. It’s still a little confusing why Shane is still staying with the group in the first place. Yes, he claims to be in love with Lori and believes her baby is his, but she’s made her position on the subject very clear. The smart move for him would be to take Andrea (who seems to be totally up for the six feet under club, if you get me) and go, but of course, then he wouldn’t be a regular on the show anymore. 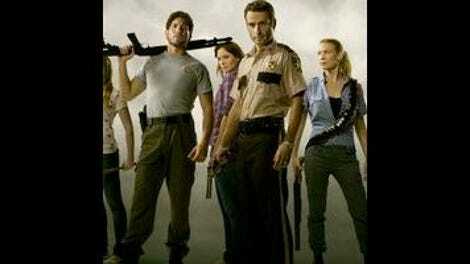 Among its many faults, TWD has never done a very good job at making its ensemble into a believable unit. Obviously, the show needs a lot of drama and conflict between its characters to fill airtime, but that drama loses a lot of its impact when there doesn’t seem to be anything at stake. I can’t imagine caring much if, say, Andrea and Shane left, or Carol and Daryl ran off, or if T-Dog realized he’s basically a shell of an idea the writers wish they’d never had and simply vanished. The zombie threat should be drawing these people closer together in a way that helps us care about them, but it never has. We’ll get to this more in a second, but everyone’s busy sniping and being angst-ridden, because that’s what people do in zombie movies. There’s no warmth here, and there should be. Shane doesn’t take Rick’s speech well, and after dropping Randall off, they get into a heated argument when it turns out that Randall knows Maggie from school. Or he claims he knows her. That means he might know how to get to the barn, which means Rick shouldn’t take the risk of letting him go. Rick wants to bring Randall back home and think about it, Shane wants to start shooting, and fisticuffs ensue. It’s an appropriately vicious fight, and of course it brings the zombies out. (Zombies that apparently slept through gunfire, because I guess windows are soundproof?) There’s a lot of desperate scrambling for weapons, with Rick managing to create pretty good metaphor for his role on the show when he gets slowly buried under a mass of dead bodies, and Shane getting trapped in a school bus. At first it looks like Rick is going to leave him behind, but then he doesn’t, and we learn a valuable lesson about how Rick’s approach to life is better for his friends than Shane’s is. Nothing astonishing here, but it clarifies their relationship to an extent, it was fun to watch, and it felt like a fairly complete unit. At the beginning, Shane claims that Rick won’t be able to protect anyone; at the end, we find that Rick is better at protecting people than Shane thinks. It’s doubtful that this has resolved anything between them, but it didn’t need to. This can be a powerful discussion, but it requires nuance, deft dialogue, and smart performances, and we don’t get any of that. It just boils down to a bunch of unpleasant people telling each other why they’re unpleasant, which leaves us nodding in agreement in our living rooms. I appreciate the attempt to make Andrea’s arguments driven by what we know of her character, but she’s only slightly more fleshed out than everyone else, and her and Lori’s spite fest didn’t expose enmity so much as it underlined the flaws in the show’s writing. If TWD made me realize last week just how poorly a job it's done at making its various protagonists into individuals, this week pointed out that ill-defined or no, it’s still very possible for me to dislike all of them. By the time it came around to Beth trying to cut her wrists in the bathroom, I found myself wanting her to succeed because I can’t imagine death being that much more unpleasant than hanging out with all these awful, awful people. Everyone is smug and arrogant and dismissive in a world where they have ample opportunity every day to see just how little they have to be smug about. No one says, “Hey, is there anything you want to talk about, Beth? We could just hang out, it’s cool,” and while I don’t expect these people to be trained counselors, I do expect a bare modicum of empathy. In a storyline about one woman’s struggle with suicidal despair, we don’t learn a single thing about her, apart from her generic unhappiness at the whole zombie-apocalypse thing. I don’t think I could pick her out of a line-up, and I just finished watching the episode an hour ago. "18 Miles Out" made me somewhat hopeful about the future. The show is getting better, although not as quickly as any of us would like. Fingers crossed that it learns to keep up this focus on more self-contained stories, and that it learns to find some way to use its living characters as well as it does its dead ones. Lori tells Maggie, “Men have to do certain things,” which feeds into her later conversation with Andrea. Lori, it seems, has some very definite ideas of masculine and feminine roles. That’s fine, and having Andrea around to disagree with her helps make this more a discussion than a show philosophy, but it still feels like the sort of argument you’d hear in a ‘60s’ horror movie. It also seems weird coming out of Lori’s mouth, but it does fit in with her Lady Macbeth move last week. Shane’s existential zombie buddy was a nice moment. They should hang out. COMIC BOOK AND POTENTIAL SHOW SPOILER TAG: Shane noticed the zombie guards didn’t have any bites on them, which you’d think would be a hard thing to tell at a glance, but I’ll buy it. Rick gave those same guards a long look before going back inside to rescue Shane. Remember that doctor back in season one? I’m betting Rick knows something the rest of them don’t. Something that might inspire him to make a speech that changes how we look at the title of the series. I expect we’ll get that speech at the end of the season, as it’s very dramatic.